Are you interested in creating a project made from recycled materials but don’t know where to start? Do you feel you lack the “handyman” skills necessary to revamp salvaged items? Some larger projects can definitely feel a bit daunting, but there are plenty of small scale DIY items that do not require any construction experience. Here at The RE Store, we know it can be intimidating to scour our store searching for inspiration and it can be difficult to visualize a finished product from the vast selection of materials, so here is a list of simple projects to get your creativity bubbling. Use a cabinet door or window trim to create your own custom picture frame. All you need is a saw to cut the frame pieces and some wood glue to put the frame together. Use all the same materials like the one pictured above, or mix and match different trims for a funky, vintage vibe. The RE Store has a number of cabinet doors waiting to be recycled into a new product. One of the easiest re-vamping projects is to select a cabinet door you find appealing and simply paint it’s face with chalkboard paint. Tape off the outer border of the cabinet door before painting to maintain a frame for the chalkboard. You can purchase chalkboard paint at most hardware or craft stores, and keep an eye out for chalkboard paint offered in colors other than black as well! For a more involved idea, you can tackle this project to build your own piece of furniture. It might be easier to modify the picture shown above and create a box as the base of the table, as seen here on the Oh! Glory Vintage blog. 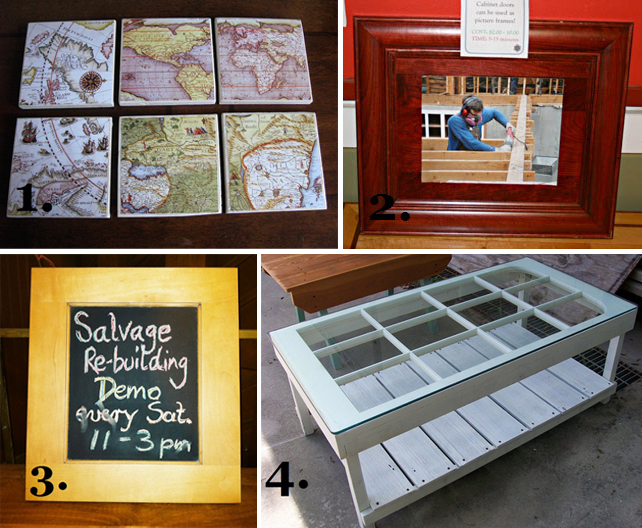 The RE Store has tons of awesome salvaged windows that have an antique feel to them. Find one you like and purchase some wood and a few hinges to complete the project. Build a box to fit the dimensions of the window and search for some furniture legs in our cabinet hardware department. Attach the legs to the bottom of the box and attach the window with the hinges, place a few of your favorite books and knick knacks on display and voila! You have created a custom coffee table that fits your personal style. As you can see, DIY projects don’t have to be intimidating or labor-intensive! Use these project ideas to channel your creativity and add your own personal touch to each of your creations. Using salvaged materials in your DIY projects is doubly rewarding because you exercise your right brain-creativity and feel accomplished about your finished product, while also feeling good about reducing unnecessary waste and lowering your ecological impact on the planet. So head down to The RE Store to find the supplies you’ll need, and perhaps you’ll find your own source of inspiration there as well. Special thanks to Diane Lawrence for authoring this article. Diane is an intern at The RE Store in Bellingham, and a senior at WWU, graduating with a Marketing degree in the spring.